Life is too short to waste on people who are too scared and damaged to keep you in their life. I must remember NEVER to make a priority of anyone who makes me an option. 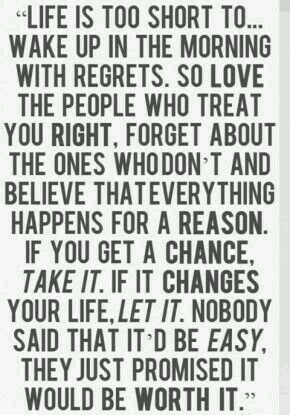 I definitely believe that everything happens for a reason. But I will be damned if I know why I cared so much for someone who proved himself to be worth so little. How could I have loved such a totally clueless fool? LOL I get love being blind, but is it deaf and dumb as well??? I know everyone is probably as sick of hearing about all this as I am of feeling like such an idiot. But I would implore you for your patience and support for just a short while. I am sorting through all that has happened and then I promise you will not have to hear anything more about Putz (yes I thought it was a fitting name). Then I will forget about him and never let him bother me again. I love hard and true, but when I am done? I’m done and there is no going back. That is just who I am. Sorry I am not yet back to my positive, happy self but at least it’s real n honest. I think that’s always better than being fake. This was stuck in comments. Thank you so much. Glad u enjoyed it! Hugs to u. “I love hard and true, but when I’m done? I’m done and there is no going back.” Me, too. Totally. But having 100% certainty about something in the mind doesn’t always translate as quickly to the heart. Please continue to cut yourself slack and remember IT’S YOUR STINKIN’ BLOG, WOMAN. Ruminate all you want as you clean mental house. Yes my heart is taking a little longer to catch up to my head. But I’m good n getting stronger. Thank you for your kindness n support. Sometimes it’s like I’m just waking up from a nightmare. So much going on …. Yes lol. How are u?? I am of the opinion that, whether we realize it or not, we tend to live on hope. Hope in religious beliefs, love, being successful in our career, earning things, whether tangible things or people’s affection. Thus, we continue to go after, whatever it is, in the hopes things work out. I have a saying that “if he/she wants to be with you, then they will. If they don’t, then they won’t.” I have also grown weary and tired of dealing with difficult people and those that want to play games. Things shouldn’t be difficult yet they always find themselves to be. I agree with you. I don’t know why it took me so long to believe it. I loathe mind games. Things are much easier with the right people in ur life. Hope ur well. Missed u xo. The light bulb goes off for each of us when we are ready. Be sure not to judge your past with the new life tools you have now. Thanks Jarrod. I’m really trying not to. Hugs n love to u too xo! Glad to hear it Vic! U back from ur trip? Back from my work trip, home for a bit and then on vacation over Thanksgiving (thank goodness). Sounds good. U deserve some R & R lol! Definitely better than being fake! It really does help me. And yes it teaches us a lesson we needed to learn. Learning from my mistakes helps me grow. Hugs xo! Re: the last line – me too.